Karimunjawa is an archipelago in the Java Sea, Indonesia approximately 83 kilometres northwest of Jepara. The island name means “a stone’s throw from Java” in Javanese. The main island is also known as karimun. Stands from 27 islands, this mini archipelago became marine national park and it’s like a treasure for those who love marine life. Here can be found protected coral reefs (very colorful plateaus and plains in deep and shallow waters), secluded and tranquil white beaches, pelican and hornbill, sea grass and kinds of sea creatures, from crabs, anchovy, starfish, sharks, stingray, jellyfish, red snappers, etc. The Marine National Park Karimun Jawa is 110,000 ha and lies 90 km north east of Jepara in Central Java. We will find mangrove forest and beach forest. The park is named after the largest island Karimun Jawa. 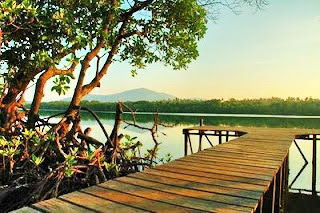 The vegetation consists mainly of mangrove and beach forest, although there is some lowland rain forest on Karimun Jawa. Most of the islands are surrounded by sandy beaches and fringing coral reefs. Fresh water is confined to a few small wells and forest streams on Karimun Jawa. A number of endemic animals live on the island while on the beaches sea turtles lay their eggs. The average tidal range is 92 cm. Most of the beaches in Karimunjawa Islands are white sandy beaches. Here you will be free for leisure to enjoy and relax while swimming, sunbathing, and snorkeling. From 27 islands in Karimunjawa, there are 5 islands that are perfect for diving, snorkeling and fishing. Five of these islands are domestically inhabited and together with 22 others from the four major zones; Zone I is the core sanctuary area and is out of bounds to all, Zone 2 is the wilderness area open to limited tourism, Zone 3 is the utilization area, Zone 4 is the buffer zone. For you who are attracted for swimming or snorkeling, you can visit The Tanjung Gelam, Menjangan Kecil and Cemara Kecil Island, and You who prefer for sunbathing, the comfort places to visit are white sandy beaches in Menjangan Besar and Cemara Kecil. To see the marine life of Karimunjawa Islands, you can visit Gosong Cemara and Burung Island by rent a fisherman’s boat. Another activities are bicycle water, water surfing, hiking and camping specially in Karimunjawa and Kemujan Island. The visitors can also see The makam Sunan Nyamplung, He was a leader in Karimunjawa Islands, a historical place where the first Dutch Ship landed. To visit every island, the visitor can rent a motorboat. Karimunjawa offers good diving experience. Various small islands around Karimunjawa are available for diving and snorkling. Pulau Tengah, Tanjung Gelam, and Menjangan Besar offers you the most beautiful scenes you have ever seen in your life. If you’re not familiar with diving, you can still enjoy the beautiful sea of these islands by snorkling, which is the safest way to see beautiful scenes down there. If diving and snorkling are not enough for you, swimming with sharks will give you more adrenalin rush. A shark’s captivity in Menjangan island serve you with numbers of various sharks. While your adrenalin pumped up to the highest level, it is really safe for you to swim around those sharks especially when local guide with maximum experience swims beside you. There’s nothing to worry about in this rare experience. Fishing is another good story of Karimunjawa, a fishing boat will happily takes you to the fishing spot of Karimunjawa island and few small islands around. Snappers, mackerels, squids and other kinds of fish are available here, to catch some fishes in the afternoon will give you stocks of delicious dinner along with fresh coconuts water from the coconut trees that easily found around the island. These can be done almost every afternoon in Karimunjawa.